You can purchase multiple Waring Harps and discounts do apply! 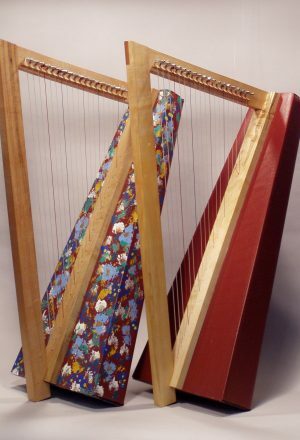 Fully built harps available on special order: $295.00. A short time to build, the rest of your life to play! 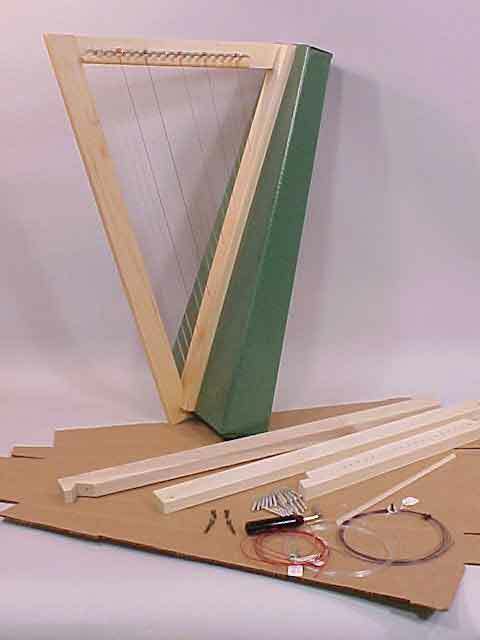 All harps come in kit form with all parts included. (Additional option to purchase assembled kit.) Hardwood components attach to a sturdy, corrugated sound box. You will only need very basic tools. Instructions are clear and easy. Decorate your own. Great for family fun! Includes strings & tuning wrench. The only items necessary for building the easy to assemble harp kit are glue and a screwdriver. There are two basic parts of the Waring Harp: the frame that defines the triangular shape of the harp, and the sound box for resonance. The sound box is die-cut in one piece from 3-ply corrugated cardboard. When painted, it is resistant even to rain. Treat it like any musical instrument and it will last many, many years. The hardwood frame is comprised of the string rib, pillar, and neck. Nineteen strings allow for over a two-octave range, enough to accommodate the playing of most any song. Zither pins (with tuning wrench) will provide tension for tuning the nylon strings. 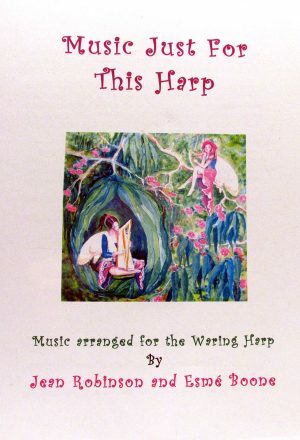 Waring Harps are true instruments and sound better than many all-wood harps. Costs a fraction of the price of equivalent all-wood harps. Features nineteen strings beginning with G below middle C.
Easy to tune to any scale or mode for accessing familiar melodies and chords. Perfect for both child and adult beginners. Accomplished players love it too. Practical for harp classes, workshops, and educational pedagogy. Well-suited for music therapy, hospice, and the healing arts. Easy to transport and store. Sits upright without a stand. Weighs only 3.5 lbs. Made from high quality sustainable materials. Extremely durable, resistant to heat, cold and dampness. Strings and string spacing meet modern standards. Decorate to your own tastes. “When people see my Waring, I always affectionately refer to it as “The Harp That Can’t Be Killed”. It has survived small children, children with various disabilities, a major household move, and of course, being dropped, pushed, compressed and being piled under without having its beguilingly sweet tone disrupted one bit”.